The Hilton Hawaiian Village sits on 22 acres of prime Waikiki beachfront property, surrounded by lush palm trees, botanical gardens, flowing waterfalls, and exotic wildlife, with the Pacific Ocean as its landscape. Once the setting for television shows like Hawaii 5-0, the village-designed property encompasses 1,200 guest rooms in five distinct towers, 90 boutiques and shops, and more than 20 restaurants and lounges. The hotel's aquatic playground has six swimming pools—including the largest pool in Waikiki— waterslides, Jacuzzis, and a saltwater lagoon, and its Mandara Spa features treatments that combine elements of the island with Asian and European therapies. Daily activities include hula lessons, kids' programs, surfing, snorkeling, and deep sea fishing; once a week a Hawaiian luau celebrates the music and dance of the island, with a fireworks finale on the beach. Golf and hiking are within easy reach, as are several prominent sightseeing spots. The resort is located on Waikiki Beach, surrounded by gardens and waterfalls, with the 35,000-square-foot spa housed in Kalia Tower. 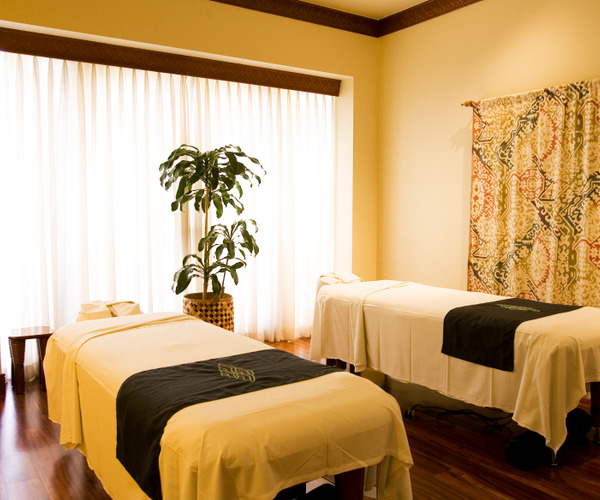 There are 25 wet and dry treatment rooms, many with outdoor lanai and spa suites for duet treatments. Other amenities include a mosaic-tiled outdoor pool, whirlpool, and sun terrace, locker rooms with showers, a sauna, steam rooms, an indoor whirlpool, cardiovascular fitness center, and a gift boutique. Treatments such as massage, facials, and body wraps and scrubs incorporate Hawaiian ingredients such as coconut, chocolate macadamia, papaya, vanilla, island coffee, sea salt, limu kala (seaweed), and Pikake flowers. Services for teens, men, and brides are available, and a salon offers hair services, manicures, and pedicures. The Exploration in Chocolate (for two) features side-by-side massages, chocolate body applications, and a chocolate scrub. Hilton Hawaiian Village offers guests lots to do with resort activities that include snorkeling, aquasize, surfing, kayaking, hula lessons, health walks, low-impact aerobics, and hula fitness. There are more than 90 boutiques that mix designer labels with local fashions on site, and the resort's array of entertainment options such as starlit luaus, music and dance festivities, and torch lighting ceremonies immerse guests in Hawaiian customs. The on-property Paradise Pool is a two-tiered freshwater pool with four waterslides—including the longest slide in Waikiki—three waterfalls, and two spas. Additional water fixtures include the 10,000-square-foot Super Pool, a five-acre lagoon, and children's and infinity pools. Half- or full-day programs such as the Rainbow Express Keiki Club, for kids ages 5 through 12, cater to vacationing families. Golfers can tee off from a selection of nearby courses, and eco-adventurers can hike among jungle, rainforest, and rugged cliff trails of landmarks such as Diamond Head Crater & Lookout. Other off-site activities include island helicopter or submarine rides, sunset dinner cruises, and trips to historical sites like Pearl Harbor, the USS Missouri and USS Arizona Memorial, and the King Kamehameha Statue, located less than a 30-minute drive away. 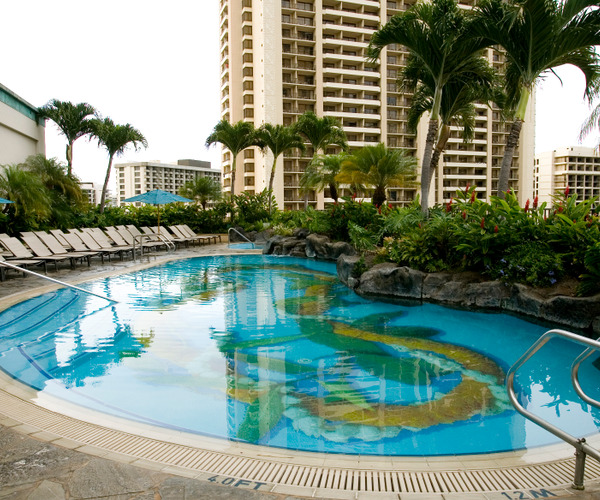 Hilton Hawaiian Village has 2,900 rooms situated in five separate towers. Water enthusiasts will enjoy the signature Rainbow Tower, a mosaic-tiled complex directly set on Waikiki Beach and steps from the pool complex and lagoon. Kalia Tower, home of Mandara Spa, has a private pool, while those staying at Diamond Head Tower accommodations have easy access to the restaurants, boutiques, and Village Green. The Polynesian-style Tapa Tower houses its own conference center for business travelers. The resort's luxury Ali'i Tower offers exclusive services such as a private pool, terrace, and whirlpool; fitness center with massage treatment rooms and sauna; and complimentary evening hors d'oeuvres. The resort features a vast international menu at its 20-plus restaurants. Dinners highlighting Pacific Rim cuisine can be enjoyed at Bali by the Sea, the resort's fine dining oceanside restaurant. Diners can watch their steak and seafood dishes be prepared at Benihana's or indulge in Japanese specialties at Hatsuhana. Pasta aficionados will enjoy Sergio's Italian Table, while the open-air Rainbow Lanai offers classic American fare and breakfast buffet in a family-friendly setting.